I need to post this on my blog, because I keep on misplacing the email that has the list in it! Blood Bound by Patricia Briggs - hard to believe I bought this book nearly 4 years ago and still haven't read it! I did read the first book in the series a couple of years ago, but as is so often the case for books that I actually buy, I still haven't managed to actually fit it into the reading schedule. Fire Study by Maria Snyder - I loved the first two books in this series, so why haven't I read the third book? 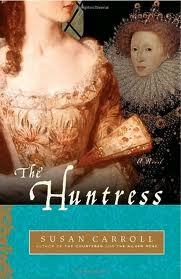 The Huntress by Susan Carroll - I was SO excited when this book came out. I bought it straight away. That was 3 and a half years ago! A Conspiracy of Kings by Megan Whalen Turner - I was definitely planning to read this one anyway! Maisie Dobbs by Jacqueline Winspear - I always intended to read this series after I was all caught up with Kerry Greenwood's Phryne Fisher series but I appear to have stalled on that one somewhat. The Scarlet Lion by Elizabeth Chadwick - because it took her ages to read her first Elizabeth Chadwick. I don't want her to have to wait long to read the next one! Witness in Death by J.D. Robb- Once upon a time we were doing joint reviews of this series. I think she is at least 10 books behind me now! Catch up, Kelly! The Summer Garden by Paullina Simons- Apparently I sent this book to Kelly a while ago. I had completely forgotten that! The Tea Rose by Jennifer Donnelly - Because I am so excited about the third book in this trilogy coming out this year! Mr. Rosenblum Dreams in English by Natasha Solomons - Such a fun book! Revolution by Jennifer Donnelly - Whoops! Doubled up on the Jennifer Donnelly recs! Our reading swap is part of a bigger swap that is going on involving lots and lots of bloggers. Kelly has the master list on her blog! Wow! That is a very high percentage! Great lists. I want to read Maisie Dobbs too, but I need to catch up on some other series. 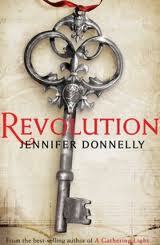 I am really interested in reading Revolution by Donnelly. Everyone who has read it has seemed to enjoy it. I am looking forward to the third book in the Rose series too! Just got Revolution. I am looking forward to the rest of the books, though. They are all books I was meaning to read anyway! Kelly, I only read one In Death book in the last year, so you might have caught up! Nise, that is my most anticipated released of 2011! Can't wait! Diane, I really enjoyed it when I read it late last year. BethF, I really shouldn't start another series, but I will!